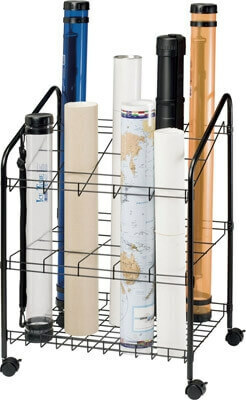 Strong and sturdy, this tubular steel roll file provides all the storage space you need for rolled documents, paper, plans and tubes. Features twenty 4" square storage openings. Includes four locking casters, durable black powder-coated finish and 3/8" diameter side tubes. Overall dimensions: 30"h x 22"w x 18"d.
Shipped knocked down with easy, illustrated assembly instructions.